Kansas City, MO, January 31, 2018 –More than 130 members and local leaders of the National Association of Parliamentarians (NAP) gathered online for the association’s first-ever Fifth-Tuesday Town Hall on January 30. President Jim Jones addresses a member’s question during NAP’s first virtual town hall. 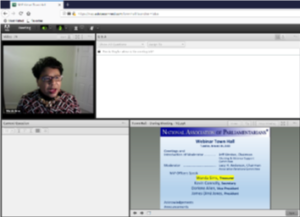 Sponsored by the new Association Relations Committee and using Adobe Connect, the online session offered a direct and informal way for members to ask questions of NAP’s officers, who responded with an accounting of how the organization is progressing and an overview of the priorities for the upcoming months. Members were invited to submit questions prior to and during the town hall to be addressed by NAP President James “Jim” Jones, Vice President Darlene Allen, Secretary Kevin Connelly, and Treasurer Wanda Sims. Moderator Lucy Anderson – Chair of the Association Relations Committee – facilitated the officers’ responses. Turnout for the event was excellent and it was clear that a lot of thought went into the members’ questions. “These town halls are just one of many initiatives being rolled out to keep members informed and to make the relationship between NAP and its members closer,” explained President Jones. 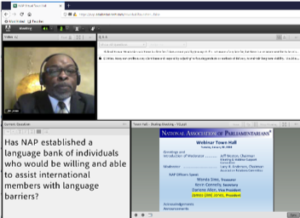 An additional benefit of the Town Hall was the use of Adobe’s online polling feature, which allowed members to voice their strong preference for online learning, support for the upcoming building fund campaign, and potential sites for an international educational experience. These responses provided NAP’s leadership insight for setting priorities and planning future activities. NAP Treasurer Wanda Sims reviews the association’s financial position. The NAP Board of Directors thank all who participated and made this first virtual Town Hall a success. Watch NAP’s Membership Update for announcements of similar face-to-face or online interactions in the future. Please plan to attend the next Fifth-Tuesday Town Hall on May 29, at 7:30 p.m. (CT), as well as future town halls scheduled for July 31, October 30.